Flying cars are part of our transportation future. A number of companies are working on prototype models globally. 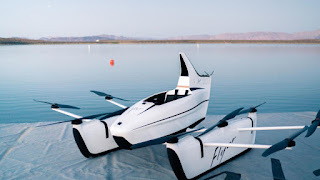 But Google co-founder Larry Page and his company Kitty Hawk Corporation have just taken off with their Flyer, a sleek, good looking, one seat, flying car. It's a pleasure craft that doesn't require a pilot license. The Flyer is engineered quite differently than other flying car prototypes like Terrafugea's Transition, which is a small plane-car hybrid that runs on gas. The Flyer is powered by ten electric fans along the sides of the craft. On the underside are slim pontoon-like "wheels" for landing. It's designed to fly over water and can stay aloft for 20 minutes. Flyer cruises up to 20 mph and hovers over the water at 3 to 10 feet. It's categorized by the FAA as an ultra-lite craft and consequently doesn't require a pilot's license. It's restricted right now to uncontrolled, remote airspace away from people and is the next generation of Larry Page's flying car program. Kitty Hawk designed this prototype as a flying machine for the "pilot" to enjoy the beauty of flight. This is not the prototype generation for urban, mass transit, which the company is committed to delivering. In the Flyer, the "pilot" controls direction and speed. But an onboard computer does the tough stuff like keeping the vehicle level and stable. MIT Ph.D Dr. Carl Dietrich and his team created the world's first FAA and NTSB approved flying car, The Transition. His company, Terrafugea, now Chinese owned, is currently working on a next G prototype the TFX. The TFX vertically takes off and lands like a driving/flying helicopter. Uber is also in the game. It plans to roll out its flying "taxis" in Dallas and LA in 2023. The issue before flying cars go mainstream is price-point. The Transition is priced at $250,000 - which is not the average cost of a family car. Also, for all flying car prototypes like The Flyer there are many FAA and NTSB hurdles that need to be met.